Did you know that Connecticut claims to be the birthplace for hamburgers in America? We didn’t! Brickle and Digby didn’t know either. We had to tell them the story. A place called Louis’ Lunch in New Haven, Connecticut proudly claims to have made the first hamburger sandwich. 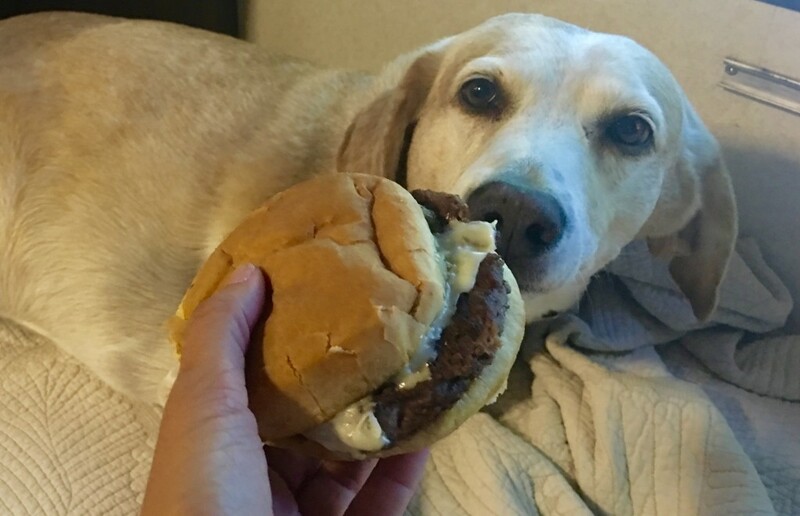 So when we stopped in Connecticut on our Adventure Of A Lifetime, it was only natural that we choose our recipe for this state as the hamburger! Of course, you can make this recipe person-friendly too by adding some toppings of your choice. Brush bread with olive oil and toast in a skillet on medium heat or griddle until golden brown. Set aside. Heat the pan or skillet and cook each patty for 4 minutes per side. Add cheese on each patty after they have been turned. Put in-between bread slices and let cool completely before serving to your dog. For a person friendly version, it is acceptable to add lettuce, tomato and onion with mustard or ketchup. That is it! Disclaimer: Also check with your dog’s veterinarian before making any changes to your dog’s diet. This is only meant as a treat and not a regular meal replacement.